We’ve all been on an unexpectedly long journey with Bilbo Baggins since he joined the merry band of dwarves back in 2012. 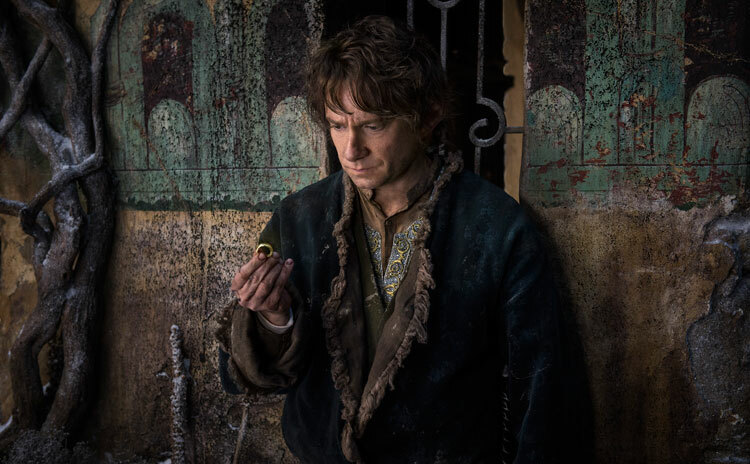 The brave and mischievous little hobbit has seen trolls, elven kingdoms, gold hoarding dragons, and even the ultimate ring of power itself. The trip back to middle earth has been a snooze at times and a roaring adventure in others. Now it finally ends in a battle even more legendary than Lord of the Rings itself. Can The Battle of the Five Armies send this trilogy out on a high note worthy of the franchise or does this film suffer from a queasy case of over indulgence? This entry of the Hobbit begins right where The Desolation of Smaug‘s cliffhanger left off as the self proclaiming agent of death flies to Lake Town to get his revenge. Word spreads of the dragon’s departure from The Lonely Mountain which brings people from all of the nations of middle earth to the mountain in hopes of treasure. Thorin Oakenshield(Richard Armitage) followed closely by Bilbo(Martin Freeman) and the rest of their dwarven companions decide to take the mountain as their own as they settle in and wait for reinforcements. Bard(Luke Evans) emerges as Lake Town’s leader and takes his people to the gates of Smaug’s old domain only to run into an army of elves lead by Thranduil(Lee Pace) who seeks to have the elven treasures of the mountain returned to him. As the tension at the mountain builds, Gandalf(Ian McKellen) is joined by Galadrial (Cate Blanchett), Saruman (Christopher Lee), and Elrond (Hugo Weaving) to vanquish the elusive necromancer before returning to his company of dwarves to warn them of the orc army marching on the mountain. As the plot would lead you to believe, The Battle of the Five Armies is loaded with climactic action set pieces filled with breathtaking visuals of bleeding blades, landscapes totally crumbling to ruin, and even dwarves riding into battle on the backs of mountain goats. The first two films had their moments, but make no mistake; this is the climax of the adventures of one Bilbo Baggins. Bringing all of these threads together in one of the biggest pieces of spectacle of 2014 is impressive to say the least, but unfortunately the enormous scope and technical achievement of the battle is just about all this movie has going for it. This may be the largest single battle we’ve ever seen in Middle Earth, but the emotional stakes have never felt more hollow and peripheral. Despite having spent two movies with the dwarves, I was never really worried about the fates of any of them. Thorin has been a wildcard up to this point thanks to his stubborn tough guy approach fueled by noble intentions but the final entry finally pushed him beyond the point of unlikable or sympathetic and into the realm of villainous. We get it Peter Jackson; greed consumes even the best hearted of people. We saw it executed far more effectively in 2001 when Boromir tried to take the ring from Frodo. We only spent a little over an hour with Boromir, but his journey into corruption and back felt complete and was probably one of the hardest moments from the original trilogy to swallow. This movie doesn’t have a single moment feeling anything like that. Instead we had to sit through over two hours of our main characters going through the motions at the end of their painfully predictable and expected arcs. If it weren’t for the outstanding acting from everyone involved, these characters would be about as cold and predictable as they come. Peter Jackson seems less concerned in delivering the emotional depth of the original trilogy, and more interested in playing with all of the world building toys he has at his disposal. Like George Lucas before him, Jackson has fallen for style, tech, and crowd pleasing over the substance that really made the classics…well classic. When it was announced that The Hobbit would be taken from two to three movies, the fan community became a little worried that there just wasn’t enough material for a trilogy. Sadly it looks like even the greatest ideas such as adapting this classic fantasy can be ruined by overindulgence. The epic conclusion to story feels less like a complete final movie and more like an overextended final act of The Desolation of Smaug. It’s 75% battle, 20% talking, and 5% hit-you-over-the-head references to The Lord of the Rings. Had these three movies trimmed the fat and tightened the bolts, we could have been looking at far more enticing two parter worthy of Tolkein’s original stories. The Battle of the Five Armies may lack a soul, but I never said it wasn’t a good time at the movies. The battle itself delivers on the high octane sequences we’ve come to expect and some of the side plots(especially Gandalf’s battle with the necromancer) deliver some truly awe inspiring imagery. Legolas(Orlando Bloom) continues to win the award for biggest audience applause, and even Gandalf gets down to some good old fashioned orc killing. This movie is filled to the brim with all of the decapitating and heart piercing action you body can stand. If you’ve come to the movie for your winter blockbuster fix, you won’t be disappointed. On New Year’s Eve in 2003 I sat in a dark theater as Return of the King played through all eight of its endings. When the lovely rendition of Into the West began playing and credits finally began rolling I felt tears rolling down my cheek after saying farewell to some of the most unforgettable characters in all of fiction. Saying goodbye to these friends was bittersweet, but I’ll never forget the emotional journey I had take with Sam, Frodo, Aragorn, and the rest of the Fellowship. It’s a moment in the movies that’ll stick with me for the rest of my life. The end of The Battle of the Five Armies did not give me the same special heartwarming satisfaction. On the contrary, I felt like I’d sat through another entry to just another blockbuster franchise. Heartbreaking. It’s been a ton of fun Bilbo, but I’m glad to say our journey together is finally over. This movie absolutely cannot stand on its own. This is essentially 45 minutes of plot stretched to a two and a half hour movie. It has its moments to be sure, but it ultimately feels less like its own movie and more like the overextended third act of Desolation of Smaug. 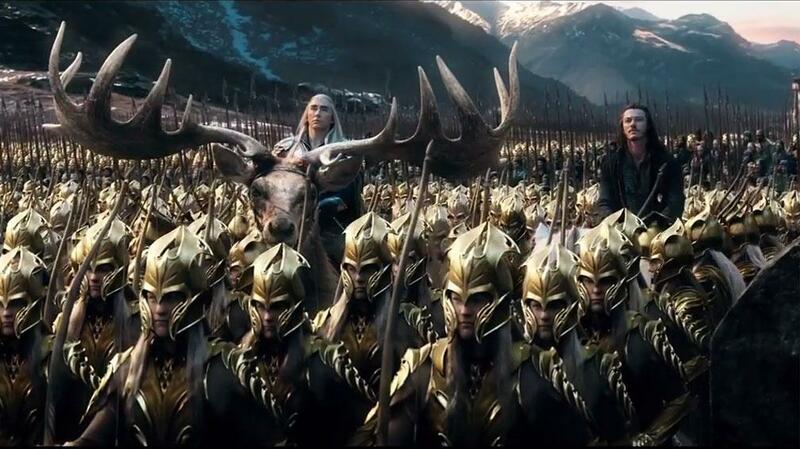 The actors in this film are all absolutely top notch with even the lesser known characters like Thranduil being immaculately portrayed. Ian McKellan still leads the pack while even Richard Armitage does a great job with what he’s given to work with. Sadly none of the characters are really interesting enough to merit the stellar cast. The final bits of the character arcs we see in this movie are painfully predictable and empty. Peter Jackson may have been off his marble to agree to doing a third movie, but he doesn’t slack when it comes to jaw dropping spectacle. Even with the overuse of CGI(especially with the orcs) this movie looks absolutely stunning. The amount of work that went into stunt work for Orlando Bloom was equally as impressive. This isn’t a conclusion that forces you to reevaluate your feelings on the Hobbit movies so far as much as it simply cements how you already felt. This movie has plenty of fun and ends another exciting adventure in Middle Earth, but the emotional depth and resonance we’ve experienced before simply isn’t there. Instead The Hobbit trilogy ends up being just another fun action packed blockbuster series.